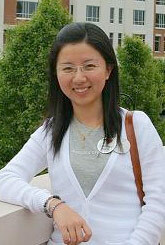 ECE Ph.D. student Bing Shi has been awarded a University of Maryland Graduate Student Summer Research Fellowship for Summer 2011. The fellowship carries a stipend of $5,000. Bing Shi is advised by Prof. Ankur Srivastava. Her research focuses on thermal and power management for computer systems. The Summer Research Fellowships provide support to doctoral students at the point of “mid-career.” They provide the opportunity to focus fully on their own scholarly activities and research at an essential point in their graduate studies. The general goals are to reduce time until earning their degree, to increase degree completion, and to improve the quality of the experience of graduate students. The Fellowships are offered as a companion program to the University of Maryland Flagship Fellows and Ann G. Wylie Dissertation Fellowships programs. Each doctoral program may nominate up to two candidates for Summer Research Fellowships. Fellowship awards were given to 48 students in Summer 2010.